Families are central to Mormonism, and creating eternal families through making and keeping covenants with the Savior is at the core of our work here on earth. However, it seems that primarily mothers, are talked about as the heart, or the center, of the families. 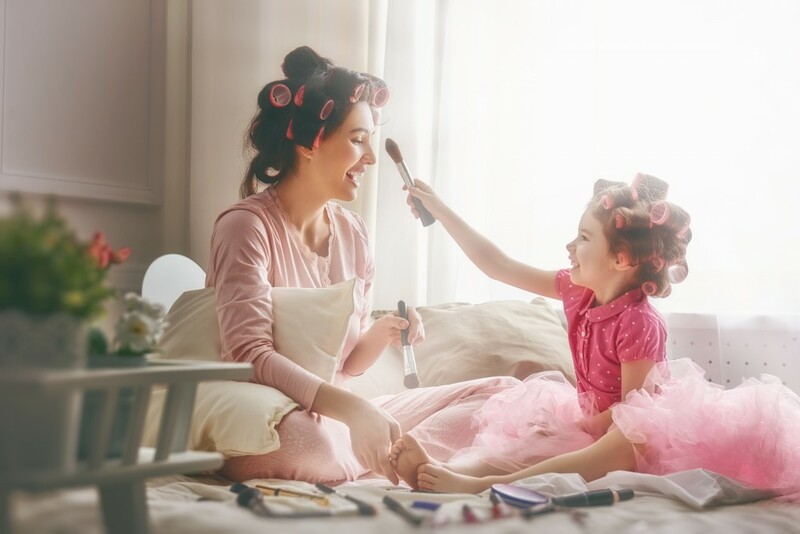 Preparing to be a “good mother” is emphasized in Primary, Young Women’s, and continues as a central thread woven throughout Relief Society lessons and discussions. When we speak of “good mothers” in church, we often hear stories of mothers’ great sacrifices (like a pioneer women burying a child along the trail West), frequent heartache and long-suffering (Elder Holland’s talk ‘Behold Thy Mother’), and the great joys, blessings, and the eternal significance of mothers. These themes echo family research that highlights a paradox of parenting — it is considered to be one of the most rewarding aspects of life while simultaneously being associated with increased stress, dissatisfaction, and even depression. Unfortunately, it turns out that many of our beliefs about “good mothering” are correlated with poor maternal mental health. When I first read findings from a study published in The Journal of Child and Family Studies that suggest that five specific beliefs about mothering–essentialism, fulfillment, stimulation, challenging, and child-centered–are correlated with poorer mental health among mothers with young children, I thought to myself, “These beliefs align with how we, in America, and in LDS culture define good mothering!” I can’t help but wonder if adding Mormonism’s emphasis on motherhood as the defining aspect of women’s lives, we just may be adding more fuel to these beliefs (Please understand I’m not disagreeing with our leaders or saying motherhood isn’t important; I’m instead concerned that it is possible to interpret these views to an extreme at the expense of a mother’s mental health). With the findings of this study in mind, I’d like to further explore our cultural ideas about motherhood, as well as give some suggestions about ways we can reframe our thinking to better support women’s mental and emotional well-being. We have often heard from Church leaders that it is mother’s influence in those early years that forms a child’s basic character. While this is not technically wrong, I have to add my voice that it’s incomplete. It’s true that mothers often spend more hours of the day with their children than fathers (particularly when they are very young), and yet to me this doesn’t support the idea that mothers are the more important, “essential” parent, but instead that both parents are needed. Indeed, there’s mounting evidence that children with involved fathers fare better socially, academically, financially, and in a myriad of other ways. This is no secret, and still we seem to elevate mother’s importance above fathers in the family unit. In our Mormon cultural conversation, we can do better in discussing men not just in terms of their priesthood stewardship, but also relating to their attachment to and engagement with their children. Thankfully, there are signs we’re making strides in highlighting just how crucial fathers are. I was heartened by President Bonnie Oscarson’s talk “Defenders of The Family Proclamation” in which she called for “elevating the divine role of mothers and fathers” (emphasis added) and encouraged us to raise our children to aspire to be parents (not just our daughters to aspire to be mothers). It was refreshing to hear the stewardships of both fatherhood and motherhood lauded from the pulpit. Similarly, Elder Christofferson’s General Conferences address “Fathers” gave me hope. We’ve heard countless talks about motherhood, and some that focus specifically on the influence and need for engaged fathers was appreciated. I find a lot of joy and fulfillment from my relationships with my children…and I find happiness in a lot of other areas of life, too. Adult relationships, personal expression and creativity, and physical activity all bring me a lot of fulfillment. And truth be told, there have been stretches of time in my 25 years of parenting that brought me much more frustration than fulfillment. Turning to our children for our sole source of happiness and fulfillment puts a lot of pressure on them to “behave,” to “turn out well” spiritually, and to excel in school in other areas. It’s not our kids’ jobs to make us happy! No one can make you happy; if they could, then they would also have the power to make you miserable through poor choices and bad behavior. Of course we will experience sadness when our children are struggling, and we’ll feel pleased when they make wise choices, but ultimately happiness is a choice we make for ourselves. I’d like to see us speak of the realities of motherhood more often, to openly acknowledge that parenthood has ups and downs, heartaches and joys. I’d also like to see more women embrace things that they enjoy as a way to re-energize themselves (particularly when parenting takes its toll) and prioritize self-care. I encourage women to consider who and what brings them joy. Maybe it’s exercise, music, career, cooking, writing, or a hobby that brings you joy. While all parents know the reality of sacrificing for their children, it’s important that you still devote some time and energy toward your own interests, too! In working in psychotherapy with primarily LDS women, I’ve noticed that many mothers seem to believe that they should be providing near constant stimulation to their children. Think of all the books, toys, puzzles, and games we invest in to keep young kids learning and active. Though it’s wonderful to promote engagement and learning, I’m concerned that the cultural pressure to teach, prepares, train, and be continuously interacting with them is not in our (or their) best interest. For millennia, children survived without flashcards, enrichment videos, extra-curricular activities and swimming lessons. Throughout history, young people have worked beside parents and played a productive role in family life. It’s only been in the past century that parents (and particularly mothers) have believed that it’s their job to provide enrichment, to get on the waiting list for a good pre-school, and to have their kid start competitive soccer at age 3. Could it be that we’re approaching parenting out of fear? Are we afraid that if we don’t enroll our children in summer programs, that if we don’t buy them the newest toy, that they’ll be bored or developmentally stagnant and will fall behind their peers? You may be surprised to know that today’s mothers actually spend more time with their children than did mothers in the 1960s. Let’s rethink how much pressure we put on ourselves to provide constant opportunities for development and enrichment. In a world of constant routine, children need unstructured playtime to develop their social skills and activate their imaginations and express creativity. Two years ago, a video entitled “World’s Toughest Job” was released on Youtube. Speaking to prospective candidates, a man posing as an employer describes a “job” in which there is a need for constant stamina, an ability to withstand chaos, unlimited work hours, and no breaks. He is of course describing motherhood, and everyone has a good laugh (and cry) at the end. The video has over 26 million views; clearly, it’s resonated with many. While I understand the intended message of the video (that motherhood is hard and that parents deserve great respect and appreciation), I think that unfortunately it adds to the “martyrdom of motherhood” trope. The belief that parenting is “the most difficult job” may make mothers feel more burdened, feel more pressure, and may create a self-fulfilling prophecy. When we believe something is hard, it feels heavier. Is it possible that labeling something as “most difficult” or “challenging” makes us feel like we’re contributing something valuable? Remember, labeling a job “the most difficult” doesn’t make it more valuable or important. Also, how can we know that mothering is the “hardest job in the world”? What are our standards of measurement? I’ve had many jobs in my life, but I haven’t come close to having experienced all kinds of work, and I don’t think that I would say motherhood is necessarily the hardest job out there. I’ve written previously about motherhood and suggested that instead of viewing motherhood as a role or a “job”, we might be wise to view motherhood as a relationship. A more honest approach would be to acknowledge the challenges and the joys of parenthood. We can recognize the sacrifice it requires without making it seem like a death sentence to our sleep and our sanity. I’d also like to talk more about coping strategies for challenges that parents can turn to when things get especially tough. While sacrifice is certainly required of mothers (and all parents and caregivers), chronic neglect of your own needs leads many moms to feel burned out and resentful. The LDS narrative highlighting the importance of sacrifice, particularly by mothers, can add additional pressure to center your life around your child. It has only been since the child development movement of the mid-1900’s that families have become child-centered. Historically, children have fit into adult’s lives. Has the pendulum swung too far the other direction? In my clinical practice, I’ve worked with many LDS women who feel guilty for spending any time away from their children, or purchasing any item that they want for themselves. Each woman must find a balance between her needs and her child’s needs, as self-neglect is not a good long-term strategy for a happy life. If you don’t include yourself in your circle of care, you will end up looking to your child to meet your needs. As fellow saints in the gospel, I think we would do well to examine our internal beliefs and practices about motherhood in order to find healthy ways to raise our children while still supporting women’s mental health. Let’s include fathers in the parenting discussion and remember that involved and engaged fathers are also important in the lives of children. We need to be give children unstructured time to play and explore, and not look to them as the main or only source of self-definition or self-fulfillment. By doing these things, I believe we can better highlight the relational aspect of parenting, and help our children feel valued and loved by modeling how to valuing and love ourselves. I feel like my 16 years now as a mother has more to do with me becoming what God needs me to become than me teaching my children who they are to become. Thus, my happiness is centered on my relationship with Christ and my relationship with members of my family, but not in the concept of motherhood. I'm not sure how else to say this, but my joy in motherhood has come from my own personal growth as a daughter/woman of God. Learning to actually give my children back to God has been one of the most difficult, yet peaceful moments in my time as a mother. For they were His long before they were min. So in the end, their own challenges and choices have determined their own relationship. My challenges and choices have determined mine, and all together we are working together to uplift, teach, and draw each other closer to our Savior. It is in the becoming(both of my children and myself) that I have found the most joy in motherhood. After a lifetime in the church - I see way too often that women let men off the hook - in both marriage and divorce - in taking active/ daily responsibility in caring for the marriage - the home and the children. Because they have a stressful important job - because they are Bishop / Counselors of the Ward - because they become engrossed in sports - other habits or addictions - and many other reasons are all excuses many women buy to let their husbands off the hook - and soon it becomes a pattern, and the women/mothers become burnt-out. Men need to learn that maintaining a home and family is an equal partnership with a woman/mother - that is a daily responsibility - a daily chore, although a loving one - no matter the excuse. Women - mothers - don't let the men in your life convince you that it is your main responsibility to carry the load - that he is tired - the breadwinner - or more importantly pre-occupied.- don't be so deceived.. You need help.